Home Good Deals Going Back To School With Sears! Going Back To School With Sears! Your favorite season is finally here! It’s back to school season! While that does mean that there is an end in sight to the crazy and hectic summertime schedules, it also means that one last hurrah is rapidly approaching. That’s right, back to school shopping! Shopping for back to school gear is always fun for your kids. They get to pick out cool new backpacks, shoes and fun folders for each class. For parents, shopping can be a completely different story. Fortunately, Sears is here to make things easier, less stressful and way less expensive! This is a sponsored post, but all thoughts and opinions about Sears are completely my own! Trends: It doesn’t matter who in the family you are shopping for, Sears is the place to pick up all of the latest trends. No more having to visit multiple different stores to stock up on all of your kids most wanted items. Sears is your one stop shop! Convenience: Sears is great about allowing you to shop flexibly. Shop in store, online or on the Shop Your Way application. They offer free in-store pick up, which means that you can shop online and pick up your purchases at your local Sears. An even better idea would be to use your Shop Your Way application to let your local store know when you are in the parking lot and they will bring your school gear right to your car! No need to ever unload your kids, the baby, to dog or whoever else you are toting around! Shop Your Way Rewards: If you are going to be spending your hard earned money on your children, why not get something for yourself, too? 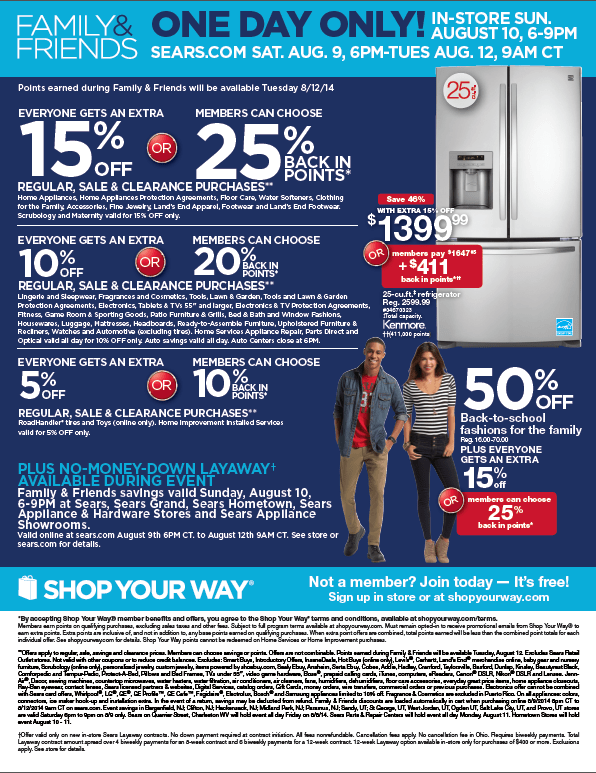 Sears Shop Your Way rewards is a great program that allows you to earn while you shop. When the back to school frenzy settles down, use some free time to pick out something nice for yourself with all of those reward points! Deals: Nothing beats a great deal, and Sears seems to have plenty of them to go around! The Sears Family & Friends Sale is the latest Sears sale, and will be starting up online on Saturday, August 9th at 6:00 PM through Tuesday, August 12th at 10:00 AM. You can even catch the sale in stores on Sunday, August 10th from 6:00-9:00 PM! Seventeen Collection: Do you have a daughter? If your answer is yes, then you’ve probably heard of Seventeen Magazine. Not only is Seventeen Magazine is a popular magazine for young girls, it is now a trendy and chic clothing line! The Seventeen Fashion Collection is exclusive to Sears and has all of the great styles and fashion that your daughter is looking for, all retailing under $50! Be sure to visit Sears’ online store between August 9th-12th to finish up all of your back to school shopping! Sears is my trusted back-to-school season partner because I know I can get everything that I need for my family without having to break the bank. The Family & Friends Sale will save you 50% off back to school fashions, so it is not a sale that you will want to miss! Back to school fashion is important for your kids! Sears takes this very seriously! See what I mean by checking out their “Back to School, Back to Wha? !” video! This is a sponsored post written by me on behalf Sears. What are your favorite back to school styles?